Funakoshi Gichin Sensei is considered the father of modern day karate-do. Read about him here. Things can often be roman ticised when one considers the past and perhaps take on almost mystical proportions. Yes, on a technical front, karate has advanced immensely over the last 100 years or so and masters of old may seem almost antiquated in their techniques compared to modern day karate-ka. However one thing is certain and that is the influence one man had, and still does have, over the direction and philosophy that shapes Shotokan karate to this very day. Funakoshi Gichin was born in Shuri Okinawa in 1868. A sickly child, he was fortunate to have in his primary school class the son of a renowned martial artist,Yasutsune Azatoa, who took the 11 year old Funakoshi and began teaching him his form of martial art – in secret at night as such training was not legal at that time in Okinawa. He also learnt from another skilled martial artist Anko Itosu and these two teachers instilled in the young Funakoshi a high degree of expertise in Shuri-te Karate and at the same time, they were also amazed at the strong sense of nobility and high degree of self discipline the young student carried with him. 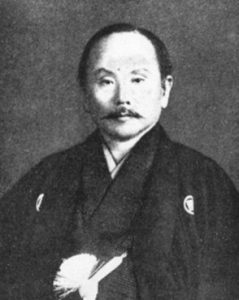 Funakoshi Gichin became a school teacher in 1888. He continued his karate training and in 1902 the ban placed upon Okinawan people 300 years earlier making it illegal to train in the martial arts was lifted and at 33 years of age, Funakoshi Gichin, with the approval of his two teachers, announced he would publicly start teaching karate. There are many stories about Funakoshi Gichin’s exploits as a youth but one thing is certain, he found more honour in avoiding a fight than in starting one. He believed there was more courage shown in fleeing a confrontation than defeating an enemy. He taught and believed that karate should not be used for self defence even as a last resort because once karate was used, the conflict became a matter of life and death and someone would be injured . . . possibly severely. 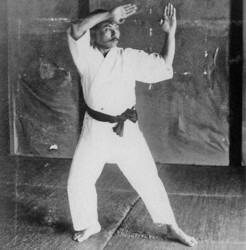 Funakoshi Gichin claimed to have used his karate against another person only once and this occurred during World War II when he was attacked by a thief. Funakoshi side stepped, grabbed the man’s testicles and held him in that position until a constable passed by. Although Funakoshi had not started the altercation, all his life he revealed he felt great shame about that day because he hadn’t avoided the confrontation. In the early 1920’s karate was little known in Japan. Traditional martial arts of kendo, ju jitsu, judo and the like were commonly practiced and then in May 1922, when Funakoshi was 54 years old, he performed a demonstration of his karate at the First National Athletic Exhibition in Tokyo which was organised by the Japanese Education Ministry. By chance, the Crown Prince of Japan Hirohito was present and was suitably impressed. On June 3rd, the Tokyo Nichinchi Shinbum newspaper described the demonstration as “a mysterious martial art” and what was supposed to be a simple demonstration at a physical education exhibition turned out to be a huge success so much so that Funakoshi was asked to remain in Japan to promote and demonstrate his martial art across the country. In 1924 Funakoshi opened his first dojo named Mesei Juku followed by the second in 1926 and by 1930 ten dojo had been opened. All in all 30 dojo were opened and in 1936 the first Shotokan dojo was opened by students of Funakoshi. More details of the meaning of “Shotokan” can be found HERE. Unfortunately this dojo was destroyed in the bombing raids by the allies in 1945. 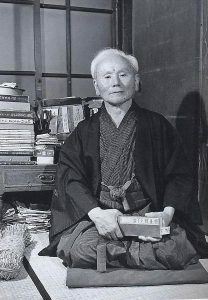 Around 1924 Funakoshi began studying Zen at the Enkakuji Temple in Kamakura with Abbot Furukawa Gyodo. He contemplated the well known Buddhist teaching that says “form is emptiness and emptiness is form” and began to see the relevance of that teaching to his martial art, and ultimately changed the characters for karate from kara+te(“Chinese” + “hand”) to kara+te (“empty” + “hand”). He also proceeded to “Japanify” his Okinawan martial art to make it more appealing to the masses and in doing so formulated a complete system of techniques and theory that would make it more understandable to the Japanese people. He changed the names of kata from the Chinese and Okinawan into standard Japanese and in 1929 also changed the name of karate-jutsu (Chinese hand martial art) to karate-do . . . The Way of the Empty Hand. To him karate had a philosophical aspect that carried through to students’ everyday lives in other words karate was a way of life . . . karate-do otherwise one only has karate-jutsu which is just the art of fighting and Funakoshi wanted to clearly make this distinction. Following this, he then defined his Twenty Precepts of Karate and established a philosophy of karate that is still prevalent today. After World War II, the followers of Funakoshi regrouped and in 1949 formed the Japan Karate Association with Funakoshi Gichin as the leader. Karate in Japan was flourishing and in April 1957, the Japanese ministry of Education gave official recognition of the JKA and it became a legal entity. A mere 16 days later, at the age of 89, Funakoshi Gichin passed away. His memorial and grave exists at Enkakuji Temple in Kamakura and is a respected by thousands of karateka each year who visit and pay homage to this great man . . . the founder of modern day karate. Funakoshi Gichin Sensei was a humble man. He placed no importance on competitions, record breaking or self glorification but believed strongly in individual self perfection. He believed in common decency and respect that one human being owes to another and these values he constantly promoted in has karate teachings and perhaps it’s because of these beliefs, karate-do has spread to every corner of the planet since his passing. Funakoshi Gichin Sensei was technically highly skilled as well, he had a strong philosophical ability But he was was also a very intelligent man and this allowed him to conceive what was perhaps his greatest contribution to karate-do and that was thecodification of his martial art and in fact patterning karate after the traditional martial arts of Japan such as judo and kendo. The under-pinning of his karate with the Budo (warrior) beliefs found in these traditional arts only made to popularise karate-do even more. People may see karate as something dangerous combining aggressive kicks punches and strikes but this is at a superficial level. 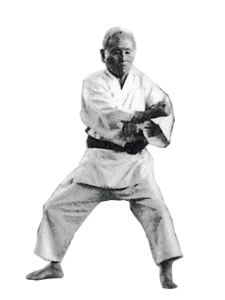 Funakoshi Sensei combined these moves with an underlying traditional Budo philosophy to make karate-do a true“way of the warrior” and this is perhaps the greatest legacy he leaves us. 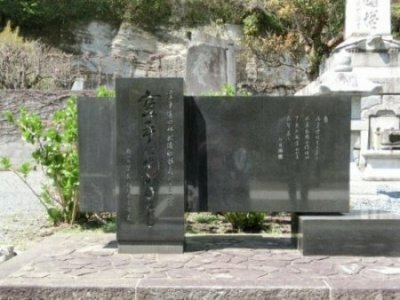 Image above shows the memorial to Funakoshi Gichin Sensei at Enkakuji Temple in Kamakura. The inscription on the left was his favourite saying and reads; “Karate ni sente nashi” (There is no first attack in karate). A very old film simply showing Funakoshi sensei (seated) in front of a group of his students who perform ‘rei’ or bow towards their sensei.